Water samples were collected from the Gulf of Suez during July, 1998. Nutrient salts (ammonia, nitrite, nitrate and phosphate) and chlorophyll-a were measured spectrophotometrically, while the concentrations of dissolved hydrocarbon fractions were measured spectrofluorometrically. The results show that the maximum concentration of heavy petroleum fractions is - 9.3 |ig/L recorded at Ras Shukeir, where high oil fields activities are centered. Nutrient salts were relatively high at the northern part of the Gulf of Suez (Suez Bay). Their concentrations were 4.14, 0.45, 4.6 and 1.04 ng at/L for NH/, NO2", NO3" and PO43" respectively. Chlorophyll-a and phytoplankton biomass were ranging between 0.12-2.54 mg/m3 and 9.0-190.5 ngC/L respectively. 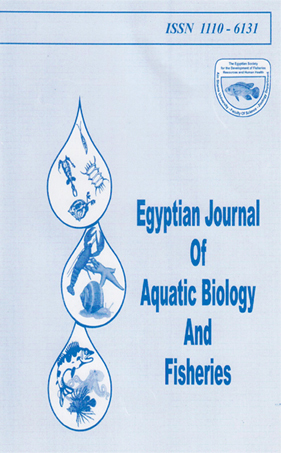 The present study revealed that the Suez Bay area can be considered as eutrophic region. This is related to sewage and/or industrial waste discharges along the western coast of the Bay. The rest of the Gulf area is considered as oligotrophic region. Also the results show that nitrogen is the limitng factor for phytoplankton growth in the Gulf of Suez.